NuGrow is a soil rejuvenation specialist and council trucks continually stream into the busy Swanbank waste treatment and recycling facility, essentially providing fresh ‘fuel’ for the business which produces huge amounts of compost from waste, which is then made available to landscapers, municipal councils and private contractors. While the company has five waste treatment facilities now, it all started with a smaller site over the road from where Jacob Wilson and his team now operate at Swanbank – which is about 20 minutes’ drive from Ipswich on the outskirts of Brisbane – some 15 years ago. "We moved to this site for the opportunity to expand, so we took over from another operator and took over the licensing that went with that," Jacob says. After snapping up more land adjacent to the original site, success came quickly and so another three sites were purchased, first at Gracemere (near Rockhampton), followed by Roma and Kogan; giving NuGrow major coverage across Queensland. "It was a major opportunity to provide waste management services to contractors working on all the new oil and gas and mining developments that were ramping in central Queensland at the time, which gave NuGrow a chance to establish itself in Gracemere with the processing of reusable mining waste." "We start early at 6am and go right through to 5pm. We start the day with safety checks, before we get stuck into the work and finish the day with safety checks and preparing for tomorrow’s efforts. Safety is key for us and that’s also a big part of why we do invest in new machines, with the latest technology to keep everyone safe onsite. "This is one of the waste management sites that produce products that are being used for the Toowoomba Second Range Crossing project. "Two products that we create onsite are Hydroganics which is composted material in hydraulic form and Growganics ready for pneumatic application of compost blankets. "The majority of product we make at this facility is compost confirming for use in our Australian Standard AS4454 and AS4419 products for our installation business Landscape Express." 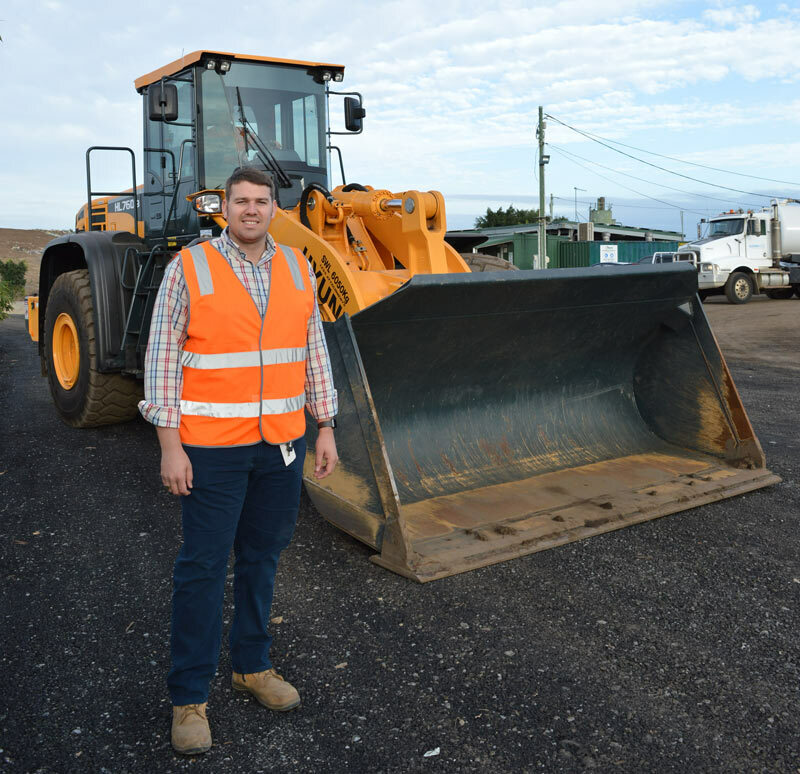 Jacob has expanded the machinery fleet from two front-end loaders and a dump truck 15 years back to two 30-tonne excavators, four front end loaders, three dump trucks and two screening plants and train today. "Were so busy we don’t often get time to think about it but we have grown enormously in that time," he says. "A new waste levy is being introduced in Queensland and the result of that will be more solid organic waste for recycling rather than landfill and we are expecting to see a lot of growth from that." "We are an environmental company so we like to have new machinery, with the latest emissions standards wherever possible. "It’s not always an option, but where we can we try to procure machines that are Tier 3 or Tier 4." 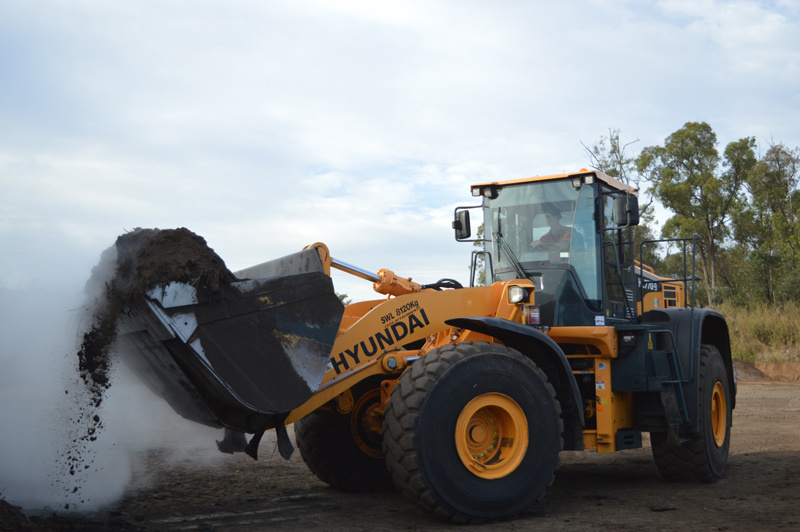 NuGrow already has three Hyundai HL770-9 wheel loaders at the Swanbank site, that have been introduced to replace their fleet of older Kawasaki ones and has just taken delivery of a brand-new HL760-9 loader, which is a just a touch smaller and more versatile than the HL770-9. "If it can operate more efficiently then that’s less diesel and fewer man hours and, for us, reducing that carbon profile is key." "Some of the tasks we use the wheel loaders for are pretty tough, were running them at a high RPM, especially when were manually mixing the solid organic waste, so they need to have lots of grunt and be able to handle that kind of operation." "We need to be sure that the machines that we buy will last in the financing time frame that we set out and that what they deliver on day one is what they deliver on day 1000. "We had no experience with Hyundai so we took a punt, but we are very happy with our decision at this point, we’ve taken delivery of a few of their machines now and we’ve got more on the way." 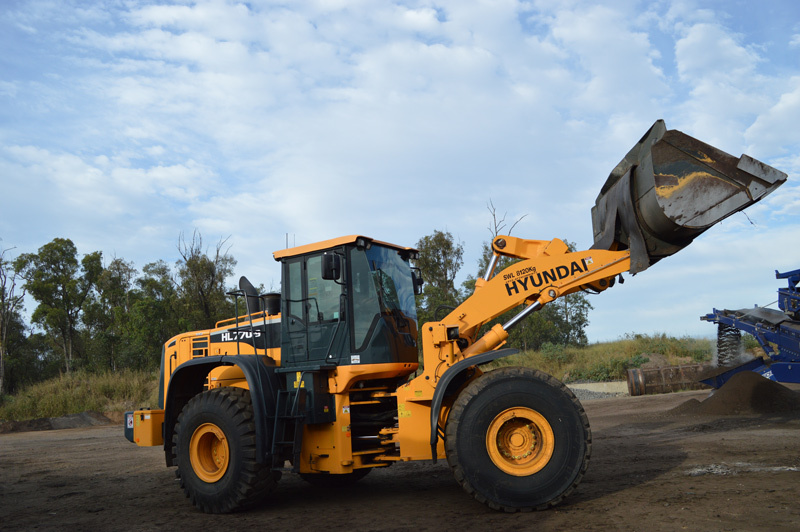 The organisation also has a Hyundai R290lc-9 excavator on order with the Porter Group, which will also be put to work at Swanbank. Jacob and his team of operator are eagerly awaiting its arrival and says it’s built tough to endure the rugged, dusty and steamy environment of their waste recycling site. This Tier 3 excavator also packs a Cummins six-cylinder turbo engine that has been designed to allow increased airflow and more evenly dispersed fuel, which results in increased power, improved transient response and reduced fuel use. 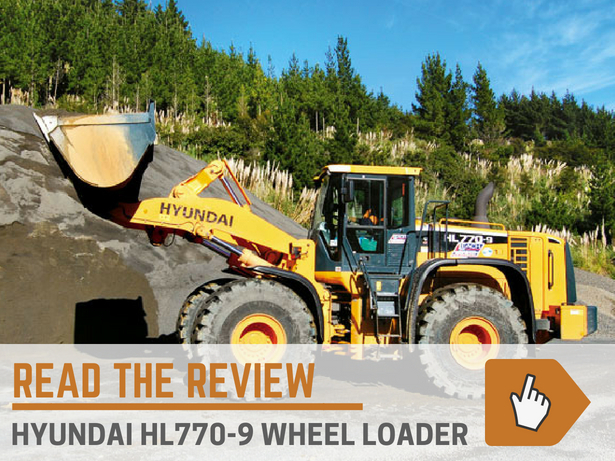 Both the HL760-9 and HL770-9 wheel loaders are Tier 3 and so hit the mark in regard to reinforcing NuGrow’s all-important sustainability profile. Key features of the HL760-9 include a Tier 3 Cummins QSB 6.7-litre engine, ZF full automatic transmission with four modes (manual, light, normal, heavy). The front and rear axles have limited slip differential for excellent traction even on tricky terrain. The hydraulic system utilities a variable displacement pump and an improved cooling system. The front window has 17 per cent more glass than the previous series of Hyundai wheel loaders for better visibility – and reversible, hydraulic driven cooling fan allows for reduced fuel consumption and less operating noise. 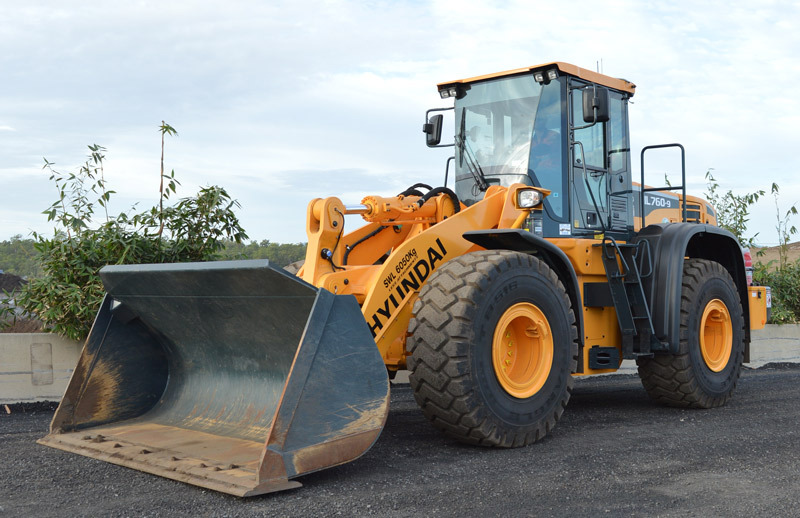 Jacob is keen to see if even further efficiencies and benefits can be gained in going for this even smaller 17.9-tonne Hyundai wheel loader in terms of economy, manoeuvrability, and fuel consumption. "Emissions standards are really important when you’re working with local government, but there are a lot of other considerations when investing in new machinery," Jacob explains. "There’s two parts to it for us; value for money on the initial capital investment and the after sales service that Porter Group provide is vital to us. "They are great to work with. They allow you to trial the machines onsite to see how they work for your specific purpose and make custom adjustments if they are needed. "We want to be covered for everything in terms of aftersales service when we purchase a new machine, so that’s very important to us. "We’re always reviewing our practices and part of that is investigating whether the machine we are currently using is the best that we can use for that application," Jacob concludes.